SCP will warrant against SCP 327 material defects for a period of fifteen (15) years from the SCP 327 concrete treatment applicationh date. In addition, SCP will warrant coverings against separating from the concrete substrate due to water migration through the concrete in the specific area(s) where SCP 327 was applied. This warranty is void if SCP’s application instructions and any other technical information stipulated in SCP’s literature were not strictly followed. This limited warranty covers against failures due to concrete water and subsurface water transmissions through the parent concrete, but not from topical surface intrusion, transfer and/or migration from an untreated external source such as flooding, or seepage through concrete via joints, walls and wall joints below grade, structural cracks, and/or other contiguous untreated areas of the facility. 1) ADHESIVES AND CEMENTITIOUS UNDERLAYMENTS. 2) EPOXY AND RESILIENT FLOOR COVERING SYSTEMS: SUCH AS (BUT NOT LIMITED TO) LINOLEUM, VCT, CARPET, RUBBER TILE AND FLOORING, HARDWOOD, EPOXY AND EPOXY COMPOSITES, MMA’S POLYURETHANE SYSTEMS AND PAINTS. HOWEVER, IN NO EVENT SHALL SCP PAY MORE, ON A SQUARE FOOT BASIS FOR THE REPLACEMENT OF THE FLOOR COVERING SYSTEM THAN THE ORIGINAL COST OF THE FLOOR COVERING SYSTEM THAT IS BEING REPLACED. 3) THIS APPLIES ONLY TO THE FLOORING SYSTEM AS ORIGINALLY APPLIED AND ONLY TO THAT PORTION OF THE FLOOR WHICH IS AFFECTED BY THE DEFECT. SCP WILL NOT BE RESPONSIBLE FOR THE REPLACEMENT OF ANY PORTION OF THE INSTALLATION THAT IS NOT DEFECTIVE, REGARDLESS OF WHETHER SUCH NON-DEFECTIVE PORTIONS ARE REPLACED FOR COSMETIC OR OTHER SUCH REASONS. 1. SCP 327 must be applied according to SCP application specifications on structurally sound and clean areas in which the concrete is fit-for-purpose, for applying specified flooring system, and meets acceptable industry standards as defined in the ACI Committee 201 Report, Guide To Durable Concrete. If the areas to which the products are applied now or in the future fail to meet these requirements, the limited warranty shall be void. 2. The limited warranty shall be void if a cohesive substrate failure at the concrete surface occurs resulting in a flooring failure, the concrete surface has been treated with any kind of integral, penetrating, and/or topical surface sealer or curing compound prior to SCP 327 application, and/or has alkali-aggregate reaction (AAR) conditions causing failure. 3. The limited warranty shall be void if the products are applied to improper substrates in areas not properly prepared according to SCP surface preparation requirements, and/or bond-inhibiting contaminants are present preventing proper penetration of SCP 327. Cracks and joints are not covered by this limited warranty. 4. The limited warranty shall be void if SCPʼs required guidelines for material coverage/surface preparation are not strictly followed (see product specifications and literature) and if the concrete is not properly prepared to absorb SCP 327. 5. The limited warranty shall be void if any structural cracks develop after the application of SCP 327. 6. 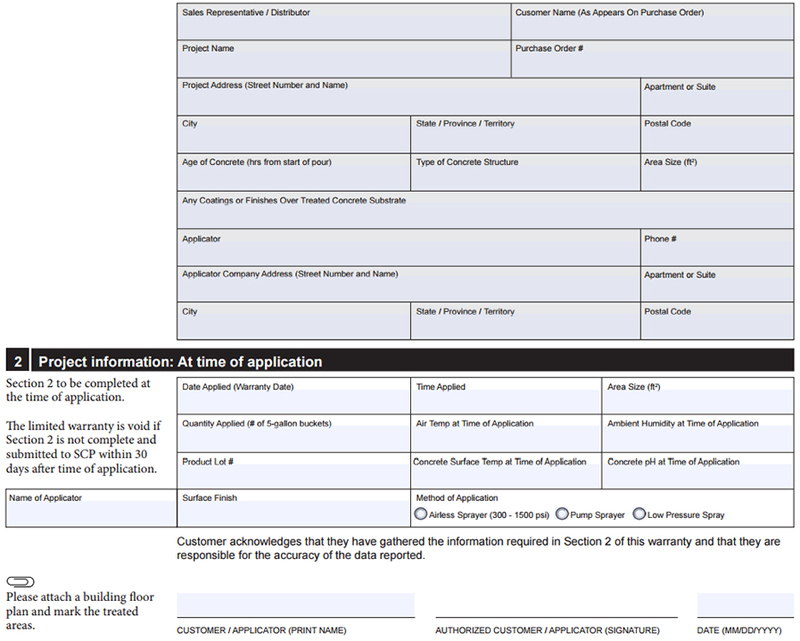 The limited warranty is void if Section 2 of this warranty application is not complete and submitted to SCP within 30 days after time of application. 7. The limited warranty shall be void if SCP 327 has been applied by an applicator not factory trained by Spray-Lock Concrete Protection, LLC or their agents. 8. The limited warranty shall be void if substrate concrete is determined, through independent forensic examination, to have not met the project specifications or engineer-approved mix design in any required constituent percentage within the tolerances allowed by ASTM C94 (for ready mixed concrete) or applicable ASTM for precast concrete. 9. This limited warranty shall be void if the account is not paid in full by 60 days from the date of purchase. For special considerations that may be necessary on large projects or any other requested accomodations please contact SCP Customer Service. Subject to all the conditions described herein, provided that SCP 327 has been made available and installed according to SCP guidelines, SCP will be responsible for reinstatement of the systems as listed above, which results from a breach of this limited warranty caused by a defect in the SCP 327 material. The account related to this limited warranty must be paid in full prior to the limited warranty being effective. Any claim under this warranty must be first presented in writing to SCP. In the event of a lawsuit, the sole venue and jursidiction shall be Hamilton County in the State of Tennessee. The recipient of the limited warranty must provide SCP a written notice within thirty (30) days after the discovery of a breach of this limited warranty inorder to assert its right to any repairs covered by this limited warranty. Claims shall be addressed to: 5959 Shallowford Road, Suite 405, Chattanooga, TN 37421, Attn: President.